The city is popular for its annual Celtic Festival, which attracts people from all over the United States and its sister cities Brecon, Wales, United Kingdom (established 1966) and Lindenberg, Germany (established 2003). Before the 18th century, Native Americans traveled to what is now Saline to hunt wildlife and gather salt from the salt springs they found nearby. In the 18th century, French explorers canoed up to the area and also harvested the salt. They named the local river Saline, which means "salty" in French. Europeans settled the area in the 19th century, most of them coming from England and Germany. Together with Orange Risdon, a government surveyor who is generally considered to be the city's founder, the residents named the town Saline, which was officially established in 1832. In 1870 railroad service, provided by the Detroit-Hillsdale-&-Indiana Railroad, first reached Saline. In 1875 Salinians built one of the city's most famous landmarks, the Second-Empire frame, ​2 1⁄2-story residential building, the Davenport House, a.k.a. Curtis Mansion. The town continued to grow, and in 1931 the Village of Saline became the City of Saline. The Saline Fisheries Research Station was built on the site of a pioneer grist mill. The city of Saline has had its own newspaper since ca. 1874  and is currently served by the Saline Reporter, now known as the Saline Post, a weekly print publication, also providing current news on its website. According to the United States Census Bureau, the city has a total area of 4.33 square miles (11.21 km2), of which 4.26 square miles (11.03 km2) is land and 0.07 square miles (0.18 km2) is water. The city is southwest of the City of Ann Arbor and northwest of the City of Milan, where U.S. 12 (Michigan Avenue) intersects the Saline River, a tributary of the River Raisin. The city is bounded on the southwest by Saline Township; on the southeast by York Charter Township; on the northeast by Pittsfield Charter Township; and on the northwest by Lodi Township. The weather in Saline is highly variable and is greatly influenced by the Great Lakes. Saline experiences a four-season climate, with summer temperatures reaching as high as 105 °F and temperatures falling as low as -29 °F in the winter. Average high temperatures in the summer range between 70 °F and 85 °F, with average high temperatures in the winter ranging from 15 °F to 35 °F. Precipitation falls year round, with snow being the main form of precipitation during the winter months. Saline experiences an average yearly snowfall of 53 inches (1.3 m), with most of that coming from "Snowstorms" and "Clippers". "Lake effect" is a common sight in Saline during the winter months; however, the snow is typically much lighter than the heavy accumulations that occur on the western side of the state, which is closer to Lake Michigan. The Great Lakes influence the weather in other ways in Saline, bringing constant clouds in the winter, even with dry air masses in place. Summers are cooler than those in surrounding states, with cool breezes off the Great Lakes when the water temperature is colder than the air temperature. The main weather hazard in Saline—as well as in all of Southeast Michigan—is severe thunderstorms and snowstorms. Tornadoes, high winds, large hail, and lightning are the most frequent causes of death from weather in the area. As of the census of 2010, there were 8,810 people, 3,699 households, and 2,336 families residing in the city. The population density was 2,068.1 inhabitants per square mile (798.5/km2). There were 3,923 housing units at an average density of 920.9 per square mile (355.6/km2). The racial makeup of the city was 93.6% White, 1.4% African American, 0.2% Native American, 2.5% Asian, 0.4% from other races, and 1.8% from two or more races. Hispanic or Latino of any race were 2.6% of the population. There were 3,699 households of which 33.2% had children under the age of 18 living with them, 49.1% were married couples living together, 10.6% had a female householder with no husband present, 3.5% had a male householder with no wife present, and 36.8% were non-families. 32.1% of all households were made up of individuals and 13.3% had someone living alone who was 65 years of age or older. The average household size was 2.34 and the average family size was 3.00. The median age in the city was 41.1 years. 24.5% of residents were under the age of 18; 7.1% were between the ages of 18 and 24; 24.2% were from 25 to 44; 29.6% were from 45 to 64; and 14.6% were 65 years of age or older. The gender makeup of the city was 47.0% male and 53.0% female. As of the census of 2000, there were 8,034 people, 3,148 households, and 2,134 families residing in the city. The population density was 1,736.3 per square mile (670.0/km²). There were 3,213 housing units at an average density of 694.4 per square mile (267.9/km²). The racial makeup of the city was 95.69% White, 0.56% African American, 0.32% Native American, 1.94% Asian, 0.05% Pacific Islander, 0.32% from other races, and 1.11% from two or more races. Hispanic or Latino of any race were 1.73% of the population. There were 3,048 households, out of which 38.7% had children under the age of 18 living with them, 54.2% were married couples living together, 10.8% had a female householder with no husband present, and 32.2% were non-families. 27.8% of all households were made up of individuals and 9.7% had someone living alone who was 65 years of age or older. The average household size was 2.49 persons and the average family size is 3.09 persons. In the city, the population was spread out with 28.6% under the age of 18, 5.7% from 18 to 24, 32.6% from 25 to 44, 21.8% from 45 to 64, and 11.3% who were 65 years of age or older. The median age was 36 years. For every 100 females, there were 86.6 males. For every 100 females age 18 and over, there were 81.2 males. The median income for a household in the city was $59,382, and the median income for a family was $73,162. Males had a median income of $51,391 versus $32,254 for females. The per capita income for the city was $26,208. About 3.0% of families and 4.0% of the population were below the poverty line, including 4.0% of those under age 18 and 4.3% of those age 65 or over. In the United States House of Representatives, Saline is part of Michigan's 7th congressional district, which is represented by Republican Tim Walberg. Brian Marl is the city's current mayor. Former mayor Gretchen Driskell was first elected in 1999 and re-elected consecutively through 2008. She was the city's longest-serving mayor as well as the first female mayor. Driskell declined to seek re-election is 2012, instead choosing to run for the Michigan House of Representatives. Brian Marl was elected to succeed her on November 6, 2012. The city council is non-partisan, and serves at large for two-year terms. Ride Saline, a transit service that operates from 8:30 AM to 5:30 PM from Monday to Friday, is available to Saline residents. US 23 is 4.25 miles east of town (along US 12), Ann Arbor–Saline Road also runs through the city's main intersection. The Ann Arbor Railroad also operates as far as Maple Rd in the north area of the city, but this portion is only used as a siding for the Faurecia Plant and only freight service is offered. Saline Area Schools operates the public schools. K–3 elementary schools operated by the district include Harvest, Woodland Meadows, and Pleasant Ridge. Heritage School (4–5), Saline Middle School, and Saline High School (located in Pittsfield Charter Township) serve the city. Lisa Bonder, professional tennis player and ex-wife of Kirk Kerkorian. Sister Cities sign, Michigan Ave.
^ History of Saline. Dikeman, Agnes L. Saline Area Historical Society. http://salinehistory.org/index.php?section=history&content=index. Retrieved 14 Oct. 2009. ^ History of Saline. Dikeman, Agnes L. Saline Area Historical Society. http://salinehistory.org/index.php?section=history&content=index. Retrieved 18 April 2006. ^ "Saline Fisheries Research Station". Retrieved 2009-06-12. ^ "Saline History". Retrieved 2009-10-13. ^ "Ride Saline." York Township, Michigan. Retrieved on May 18, 2010. ^ ".". Retrieved on June 28, 2010. 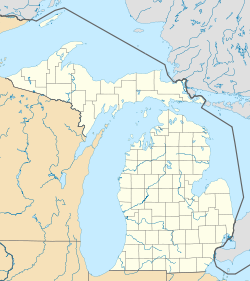 Wikimedia Commons has media related to Saline, Michigan. This page was last edited on 24 April 2019, at 13:37 (UTC).